As we wrote about earlier this week, this offseason is going to be one of transition and tough decisions for the Kansas City Chiefs. After tagging Dee Ford last week, there are some reports that they are releasing long-time stalwart Justin Houston in a move that was likely necessary given his cap number, injury history and additional needs on a struggling defense. 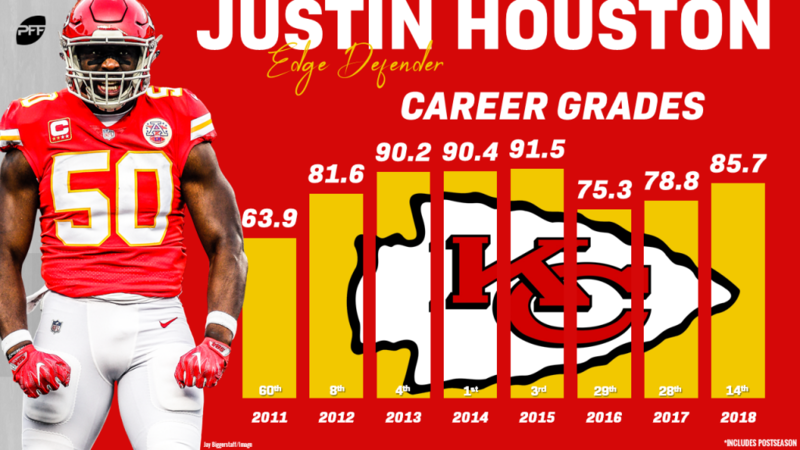 Houston was a truly great player for the Chiefs, earning over a 75.0 PFF grade in all but his first NFL season, and an overall grade above 90.0 in each season from 2013 to 2015. He was a force as a pass rusher as well as a run defender, racking up 408 total pressures and 285 run stops on over 6,400 career snaps for the Chiefs. In our wins above replacement (WAR) metric, Houston was worth over four-and-a-half wins, trailing only Alex Smith, Patrick Mahomes and Travis Kelce on the Chiefs during that period. His brilliance notwithstanding, it’s difficult to make the argument that the Chiefs got what they were paying for in Houston’s six-year, 106-million-dollar deal that was signed prior to the 2015 season, which included a $20.5-million signing bonus and $32.5 million in guarantees. Houston never reached his career-high 1.13 WAR of 2014 after the contract, and he only played over 1000 snaps in one season after signing (2017), missing 21 games during the course of the deal. 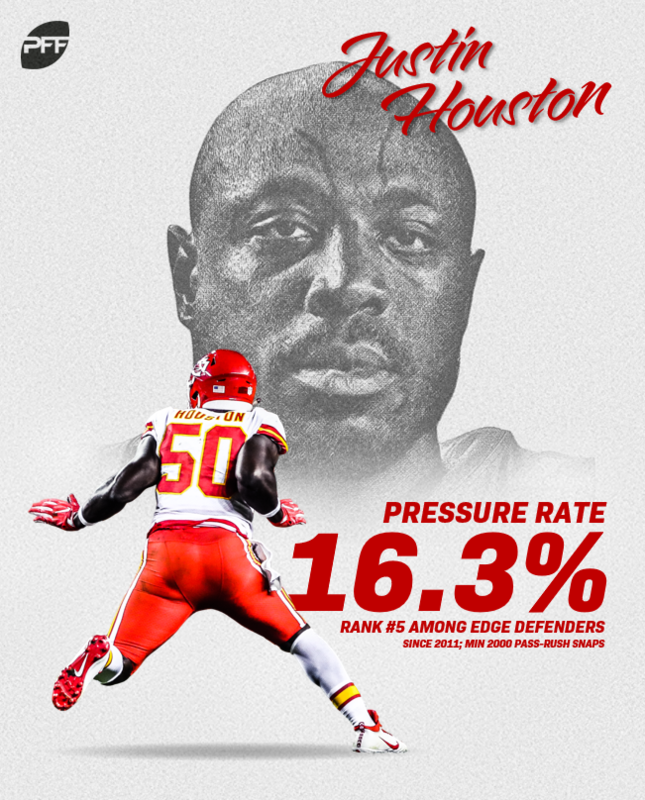 In that time, players like Ford and interior standout Chris Jones (0.97 WAR in 2018) have emerged up front for the Kansas City defense, and despite this emergence (coupled with Houston’s play) they were still a bottom-five unit in 2018 because of their inability to cover both at the linebacker and secondary level. Houston’s $14 million in cap savings should go a long way to cleaning up the back end of their defense, with Ford and Jones more than capable of manning the fort up front. As for Houston, he’ll likely have a sufficient number of suitors should he seak a reasonable price. Even with the aforementioned dip in his value, it’s difficult to find edge players that can play both sides of the line of scrimmage equally well, while being a force as a pass rusher (89.1 pass-rush grade in 2018) and run defender (77.2 run-defense grade in 2017). Since he was unwilling to take a pay cut to stay with what will likely be a Super Bowl contender in the AFC in 2019, it’s reasonable to assume he’d be interested in a quintessential Patriots one-year experiment, especially given the fact that star defensive lineman Trey Flowers is set to be a free agent and is surely likely to leave for a new team given what his contractual demands will be. If Houston is looking to break the bank (again), without concerns pertaining to the strength of his next team, a club like the New York Jets – with over $100 million in cap space and a substantial need at edge defender – could be a solid landing spot. Kansas City’s intra-division rival, the Raiders, could also be in the market for the veteran’s services, with almost $80 million in space, but appear to be on the front end of a rebuilding process that didn’t see enough space to retain Khalil Mack, let alone a player in Houston’s stage of his career. There could also be a chance that he returns to Kansas City on a smaller deal after testing the market, but that would involve the uncertainty associated with switching to Steve Spagnuolo’s 4-3 scheme and the drop in pride that would be necessary to return after being initially released. This move makes sense for both the Chiefs and Houston, with the former looking to rebuild a defense under Spagnuolo and the latter wanting to continue what has been a great career in a different setting after seeing the pieces around him fall from a top-ranked unit in 2013-15 to a bottom feeder in 2018.